C&S Building Services is a small, family owned, award winning building company and have been working in private homes and commercial premises around Staffordshire, Cheshire and Shropshire since 1981. C&S Building Services have earned their place as one of the area’s most trusted and respected building companies. For almost 30 years C&S Building Services has undertaken a wide variety of building projects, large and small, for both the public and private sectors, in both commercial and domestic environments. The Company has a long standing relationship with local authorities throughout the region and it’s this relationship that saw C&S Building Services win an Award with the LABC (Local Authority Building Control). LABC is responsible for ensuring that buildings are safe, healthy and accessible. This is achieved through ensuring that new construction is in accordance with the Building Regulations. 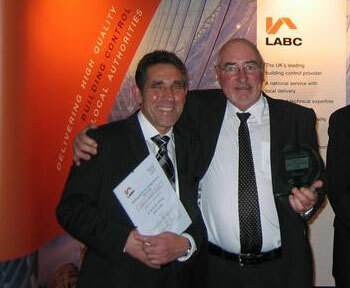 The LABC wanted to reward quality work, and to counter the damage done by stories about cowboy builders. This Award is made to builders who achieve outstanding quality in their construction work, particularly related to the building control process. Sites were evaluated against a comprehensive marking scheme before a panel of expert judges made the final decision. The judges picked the most innovative and attractive developments from hundreds across Staffordshire.